The coming Standard Chartered Singapore Marathon (SCSM) 2018 will be held on 8 and 9 December 2018. 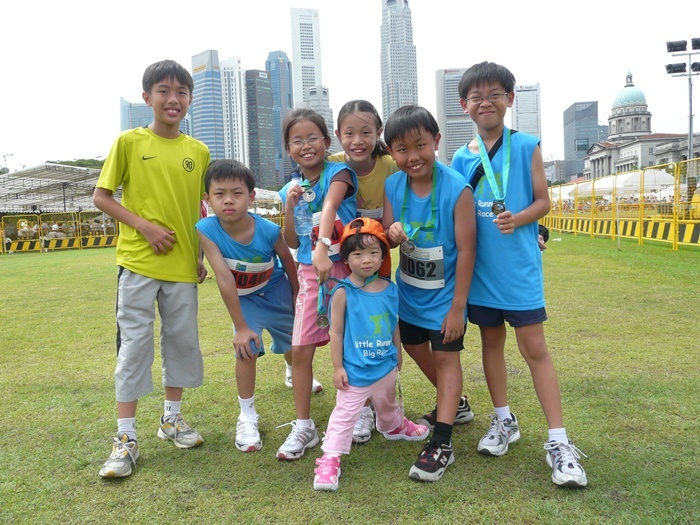 SCSM has established itself as the marquee running event on Singapore’s sporting calendar. 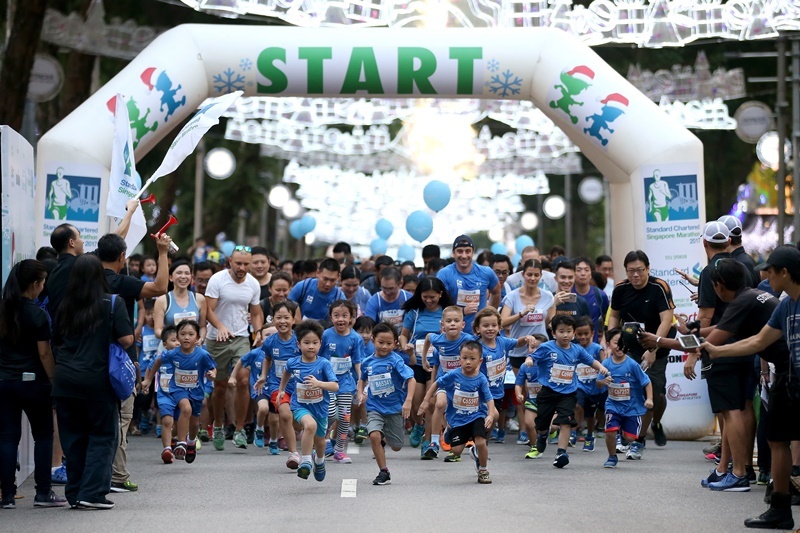 One of its most popular running categories is Kids Dash and it is Singapore’s biggest children’s race, the Standard Chartered Singapore Marathon 2018 Kids Dash returns this 8th December and for the first time ever, the event will be held at the Universal Studios Singapore (USS) in Resorts World Sentosa. 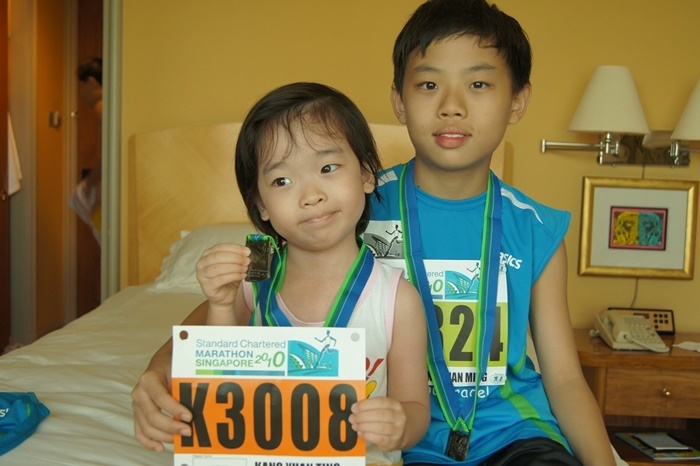 Kang Yuan Ting, a 12-year-old girl has been running the SCSM Kids Dash category since she was 2 years old. She has grown up with the SCSM, and this year will be her final SCSM Kids Dash as she will no longer be eligible for the category in 2019. Yuan Ting plans to ‘graduate’ and will be running the 5km next year. She had made the request to run in her final SCSM Kids Dash, given that the race will be held at Universal Studios Singapore (USS). The family of 4 will be spending time together at USS after the race on 8 December 2018. 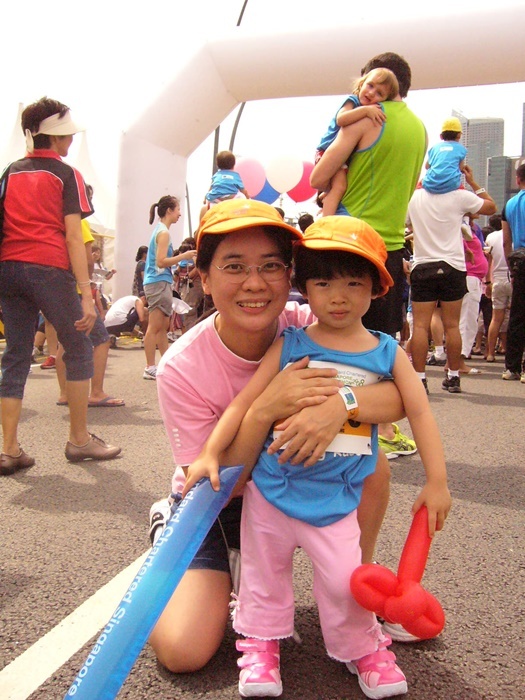 Our Parenting World – OPW Media team is pleased to interview Kang Yuan Ting who will be sharing her thoughts on participating in Kids Dash for 10 years and her love for running. 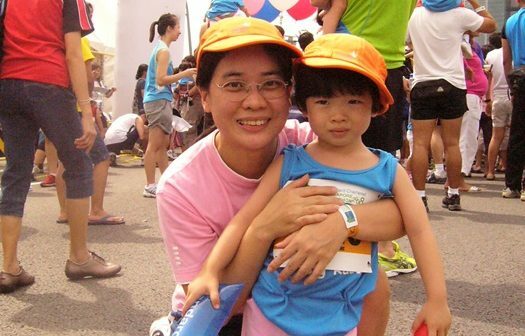 We also speak to her mother, Tan Lye Tin, 49, IT Consultant, about parenting and how to encourage children to live a healthy and active lifestyle. 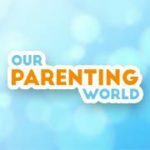 Through the interview with Kang Yuan Ting and her mother, Tan Lye Tin, we would like to encourage parents to lead a more active lifestyle together with our children! 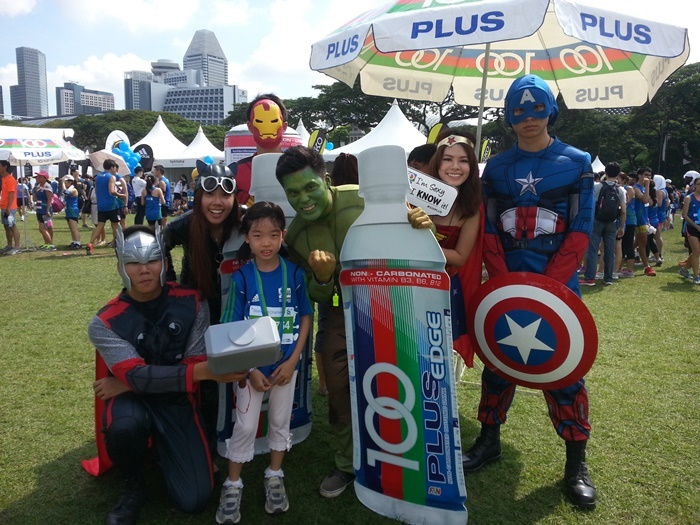 1) Tell us why you like to run the Kids Dash every year? I feel like it became kind of like a tradition. At first, my mum was always very enthusiastic to sign me up and I just agreed. It was a good way to use my time, in fact, school wasn’t busy at all in the earlier years so I had all the time to spare. After a few years, my mum would continue to ask me if I wanted to participate, and of course I wanted to. It felt like an instinct. Of course, it was always very fun to run with my peers. While running with other kids, I would marvel at those sprinting in front of me – as I was not really the best at running but I still liked it. The wind blowing at my face, the parents – and mine – cheering at the sidelines, it was thrilling. To me, it was also an opportunity to exercise. As I grew older, the amount of time school gave to students for physical education decreased and we spent less time exercising. So I wanted to make use of the chances I got to run. 2) What do you remember about your first few Kid Dashes? The memories are not clear. I started running when I was very young, so I can’t make out full memories, just flashes of me running with my mother, my mother rapidly taking photos of me while catching up with me. 3) Tell us about running and cycling with your family. I cycle more than run during free time. I mostly run for races like Kids Dash. For cycling, I cycle with my mother. Before moving away, I had two cycling routes. One towards MBS or Gardens by The Bay, and the second towards East Coast Park. We go towards MBS more. We’d often go to East Coast Park in the morning, and MBS in the night. It’s like a schedule and I want to continue doing this in the future. 4) Tell us about how you did well at PE in school because of your running and cycling hobby. How did you feel that day? I don’t really excel that much in PE actually. Most of the time, I do better in long distance races like the NAPFA run, compared to short distance sprints at school. My stamina has gradually improved. It’s a great sense of achievement. 5) This is your eighth or ninth Kids Dash. What do you hope to accomplish this year in your final Kids Dash race? Maybe I can aim to run within two to three minutes? Might be too much of a challenge to me, but I’m willing to try. 6) Tell us about your debate club. Why do you enjoy it? Do you enjoy any other hobbies/activities? I can practice thinking in other perspectives while debating, as I need to think of different points on how my side of a topic is better than the other. I have a loud voice since young. I’m often very talkative to close friends, but shy to strangers. So, as I improved in debating with my friends and speaking aloud in a closer proximity, I did better for the oral exams after going for debate. I actually got full marks for my oral during prelims! I enjoy art, listening to music, swimming and reading. My main interest is art. In fact, I have successfully admitted into SOTA! 7) What are your running plans for the future? We hear you are running the 5km next year? Maybe the 10km? I’d like to run the 10km with my mother. Maybe one day I’ll run a marathon, who knows. Of course! I have already participated in the sundown marathon 5km twice; one this year and one the previous year. I’m comfortable with this distance, so I’m pretty eager to participate. 8) How does running make you feel? I get to de-stress while I run. Sweat dripping away from my body is like my troubles and stress leaving me. However, the reality is you get really really exhausted and your body wants to just drop to the ground immediately. It’s the down side of it. 9) What has running done for your self-confidence? Each time I go for a race, I get more motivated for the next race. I feel more confident as well as encourage myself to be enthusiastic and have more courage. Thank you Kang Yuan Ting for taking our interview! 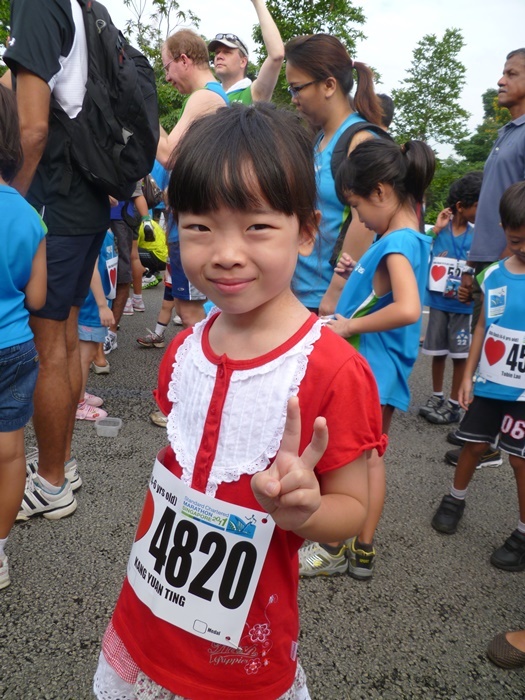 1) Why did you first sign Yuan Ting up for the SCSM Kids Dash when she was 3 years old? It started with her brother, 7 years her senior who also started running Kids Dash at a young age. I would signed up both of them every year in Kids Dash and other races for children, be it competitive or not. Being a runner during my school days, I want to expose them to running, and to build up their stamina. Through running, it also helped them to cultivate perseverance and determination in them. It’s a simple sport where all normal kids can do. 2) What advice do you have for other parents in cultivating a healthy, active lifestyle for your children? I want to expose my children to different sports. I have brought my daughter to races so that she get to run with other children. I taught her how to cycle and she picked up very fast. We then cycled together more often and longer distance. I sent her to swimming lessons and we swim together at our free time. To cultivate a healthy and active lifestyle to our children, you have to do sports together with them. It is important to see you doing same sports together. They see you as a model example. 3) How important is it for parents to cultivate a culture where the family exercises together? It’s a good time to bond and share the experience. As we grow with them, they will cherish the feelings and memories we had spent together. 4) Do you have any tips for watching over a child’s nutrition? We have simple yet nutritious meals. We rarely have soft drinks, junk food, processed food and fried food. We have fresh milk and Milo. We maintain healthy BMI, keeping ourselves slim and fit. It’s important to start the correct eating habits from young, like eating various vegetables & fruits, drinking milk. Teach them not to be picky on food and do not waste food. 5) Through the years, as a parent bringing your child for Kids Dash, how has the SCSM changed? We hear the Kids Dash is at USS this year and it must be exciting for you and your family to spend time there after the race? In the earlier years, it was always at the Padang and my daughter looked forward to the fun fair after the race. We could also see runners from other categories. One year was at Sports Hub, then two years at Orchard Road. This year will be a special and memorable year as it will be her last year in Kids Dash. She will miss the race after running for so many years. At the same time, she’s so thrilled to have fun at USS after the race. Next year onwards, we can run together again, in 5km, or even 10km. Thank you Tan Lye Tin for taking our interview! Just in time for the school holidays, the Kids Dash is the perfect weekend activity for families as they get to run and bond together! Young runners and parents can look forward to an all-new route filled with fun and excitement as they whizz past different zones, from the fairytale wonderland of Far Far Away featuring Shrek and Princess Fiona’s castle to the lush jungles of Lost World.